The market orientated reforms of the 1980s and the 1990s combined with several years of commodity-driven prosperity have been transforming América Latina into a region of wealth and prosperity over the last decade. The commodity boom together with more progressive social policies has started to create more dynamic and less unequal societies across the region. Thanks to the commodity boom and rising revenues, governments have presided over a time of rising incomes for the new emerging middle classes in many countries in América Latina. However the increase in wealth has been occurring against a background of an ideological battle between reformers (mostly liberals and social democrat politicians) and those such as Mr Chávez (Venezuela) and potentially President Christina Kirchner (Argentina) and others of the ALBA grouping who would rather return to the authoritarian and populist past. At present the reformers appear to be winning the debate. This is illustrated below in the Economist's Latinobarómetro published in October 2011. Even so there has been a slight fall in optimism over the last year. This chart clearly shows Panamá with the most ongoing optimistic outlook. The US, América Latina's northern neighbour on the same continent has so far failed to appreciate the rising importance of América Latina with its expanding market for the north's exports, its huge investment opportunities, its enormous reserves of energy and minerals and its continuing supply of needed labour. However at the same time and despite their recent growth and globalisation, the economies of América Latina still depend on the US for capital, know-how, technology and remittances. If geography is destiny and the US and América Latina need one another so much, the obvious question is why are the two not pursuing a more joint approach to consolidate their relations in a meaningful way? The answer to this question turns on key policy differences on three main areas. Firstly, immigration, many in América Latina find the idea of building a wall between the México and the US particularly offensive. Secondly, the war on drugs, the North's war on drug trafficking serves mainly to spread corruption, increase criminal violence and generally undermine the rule of law. Finally, the embargo on Cuba imposed by the US is seen as counter-productive and likely to have prolonged the repressive rule of the Castro brothers rather than ending it. However none of these policy issues is easily resolved due to domestic US politics and less so in an election year. Immigration has been a particularly toxic issue in the Republican primaries. To make progress in the war on drugs, the US needs to curb demand for illegal narcotics at home, but US politicians are loathe broach the the idea of decriminalisation. And the Cuba policy is held hostage by the swing state of Florida and its residents of Cuban origen. 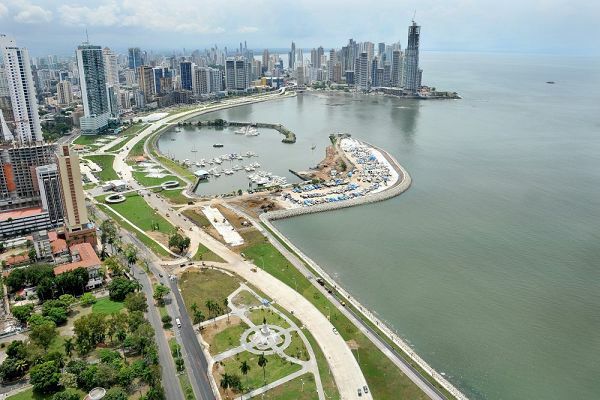 Panamá is the success story of the first decade of the 21st century. Business of all kinds continues to grow, in a land coveted in the late 17th century by the pirate Henry Morgan and occupied since the beginning of the 20th century by the US President Roosevelt, to build the Panamá canal and link the Pacific with the Atlantic on the narrow isthmus. During many decades, the country has served as a hiding place for multiple legal and illegal dealings, from drugs to weapons and political conspiracies and money laundering. Nevertheless the Panamá of the 21st century has many feathers to its bow: a chanel, an international banking center, the world's first merchant fleet, a free trade area which is one of the main bases for the collection and re-export of inland freight, an interoceanic railway, seven private ports and dozens of casinos and property developments (as the above picture shows). Panama in 2011 was placed at the head of economic growth in Las Américas, an increase of 10.6pc of GDP, against 9.2pc in 2010, according to the Statistics and Census Institute (INEC) of Panamá which likely explains the optimism in the Latinobarómetro above too. US President Nixon declared the war on drugs 40 years ago, interestingly the front that he opened in 1971 has survived all his successors up until now. The Presidents of Brazil, Colombia and Mexico were the first to speak out on the failure of the war on drugs, Fernando Henrique Cardoso, Cesar Gaviria and Ernesto Zedillo respectively. Recently, the current president of Guatemala, Otto Perez, and the former President of Colombia, Juan Manuel Santos, have also spoken out to demand the opening of a debate on the decriminalization of drugs using the legitimacy granted to countries suffering the most tragic consequences of victims of the war on drugs. Honduras topped the global homicide rate, with 82.1 homicides per 100,000 population, followed by El Salvador. México has also been immersed in the drug war for the last six years, with almost 50,000 people dead and the homicide rate has increased by 65% since 2005 according to UN data. The legitimacy of key leaders of América Latina speaking out, coupled with the figures of the dead has forced the US president, Barack Obama, to finally address the issue. In the US in April 2012 Obama said "We recognize our responsibility in this matter and I think it is entirely legitimate to engage in a discussion about whether the laws now in force are laws that perhaps are causing more harm than good in some areas." When Obama spoke, everyone understood: it is time to talk about drugs. The issue that is a constant drag on América Latina has finally reached the international agenda, a further sign of the América Latina's rise.